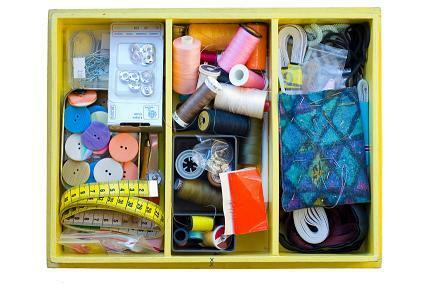 A sewing box helps you organize your supplies. Ideally, sewing room supplies organization began with the first items you purchased. You had a place to keep your scissors, your tape measure, your threads, the stray buttons and the rulers. But as any quilter or seamstress knows, no matter how well you plan ahead, you will soon have a large collection of these items that will be hard to keep track of. You certainly can't just throw them all in a drawer and expect to be able to find what you need! That's why organizing your supplies is so important. Sewing often begins as a hobby. You decide to take a quilting class or spend time with friends or family members who sew. Many people receive their first sewing kits from the person teaching them. As with all hobbies, you will have scraps and leftovers. Some you will keep and others you will throw away. You'll pick up a standard pair of scissors. Soon you find yourself wanting a rotary cutter. Cutting mats in various sizes are incredibly handy to have, as are patterns and a dress mannequin. The type of sewing you do will dictate the type of supplies you need. Pins should be stored in a clear plastic box or in the pincushion itself. Needles should be stored similarly. You do not want to reach into your sewing box and stab your fingers. Tip: Use your sewing scissors for fabric and thread only. They will dull if you use them on other items and cause snips and tears in your fabric. Sewing boxes are ideal for carrying your sewing supplies with you, but you cannot pack all of them into the box or basket unless it is over-sized. You will need a drawer for your thread. If you sew, you likely have a large collection of thread in multiple colors. A standard case size for thread will hold 30 to 40 spools of thread. Not all spools come in the same size, so you may need multiple cases or drawers to store your thread. A sewing cart or table is another option. They come with built in storage space for your sewing room supplies. Beyond the tools you use to sew with, you'll need to store the fabric you use. A closet makes for an ideal storage space for fabric. Be sure the closet has plenty of light so you can actually see the colors of your fabric. Organize the fabric by color, by pattern or by theme. You may also use a combination of all three. Fabric storage does not have to be in your sewing room. For most projects, you will be matching your fabric or picking it out first. For smaller areas, maximizing your space is the best option. If you do not have a closet to store fabric in, use printer paper boxes or non-plastic storage boxes. Plastic doesn't breath, air tight boxes can lead to musty, odd smelling fabric. You want to keep the fabric clean and dust free. Label the cardboard boxes used to store fabric to make it easy to find. Resist the urge to buy supplies when you do not need them. It is a mistake novices make to pick up too much fabric (for mistakes), too much thread (because you're not sure how much you need) and to keep scissors even when you replaced them. Plan a yearly clear out of tools that you don't use, particularly if your storage space is limited. If you have too many supplies and you need space, consider creating a sewing basket gift to give to a friend or family member. You can provide them with all the basics to get started and free up storage space at the same time.